Acchino Auto Body is the most trusted auto collision repairs, auto body shop, and car services shop in the Rome, NY area. "If you want it done right the first time, at an agreed price, as well as on time, there is only one place to go. Acchinos." Looking for a trust worthy repair facility? Come to Acchino Auto Body, LLC, in Rome, NY. 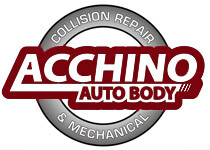 Acchino Auto Body is an independent body and mechanical repair shop in Rome, NY. We have been in business since 1950 and pride ourselves on the high quality of service and work we provide to each customer that walks through our door. We believe in building strong lasting relationships with each and every one of our customers, focusing on their individual needs and then working to meet them. An important distinction between Acchino Auto Body and other auto body repair shops, is that we are an independent repair facility. We are not aligned with an individual insurance company and do not participate in any insurance network. Doing this would make us relinquish our ability to service our customers. When an auto body repair shop works directly with insurance companies they lose their ability to be an advocate for their customers and to provide high quality service. Insurance companies tell these other auto body repair shops how to fix the vehicle, the time frame in which it must be fixed, and what kind of parts can be used. This is a recipe for disaster and does not provide the customer with the quality of work or service they deserve. At Acchino Auto Body we pride ourselves on the fact that we do not align with any insurance companies. We truly are your advocate for each customer that walks through our door. Besides, it's your car so it should be your choice. Insurance company steering can happen when you make an automobile insurance claim. The term "steering" refers to the process where an insurance company uses extraordinary influence, pressure tactics, or some other deceptive method of forcing you to use specific auto collision repairs, auto body repairs, or car services facility of the insurance company's choosing, to repair their damaged car. Some of our customers have been told by their insurance company they must take their car to a specific location for the estimate - the insurance company's participating body shop. This is not an ethical business process. Once there for an estimate, the customer is hustled into having their auto body repairs or services done there. The customer is often promised instant priority placement, immediate rental car availability, lifetime guarantee and more, in order to lock in the job. What is not disclosed is the repair shop's mandate to use junkyard parts, aftermarket parts and a number of cost saving concessions in order to become an insurance company participating preferred repair or auto body shop. This is steering and the State of New York is very interested in hearing from people that have been "steered" and "hustled." Most people find out, after the fact, that they had the right to use the repair shop of their choice. If you feel you have been an unsuspecting victim of insurance steering, the Consumer Assistant Unit of the New York State Department of Financial Services would like to hear from you. Mike's Towing is Acchino's authorized towing company. He covers towing for our auto shop 24 hours a day, 7 days a week. If you've been in an accident, just ask for Mike's and he'll bring your car right to Acchino's. He will take good care of you! Acchino Auto body carries a variety of different tires including Hankook & Cooper Tires. Stop in today for new tire installation, alignment, & balancing. Stop By Acchino Auto Body Today!